This is not a quick recipe, it isn’t difficult either, but you’ll need to start it 24 hours in advance. Poaching quince slowly brings out it’s beautiful dark pink colour and infuses it with whatever lovely herbs and spices you decide to poach it in. It also makes your house smell incredible for the day. The best thing about this recipe is that you can adapt it to suit whatever you have in the cupboard. Use leftover red or dessert wine, or just water if you prefer, or swap for cinnamon, cloves, ginger cardamom, oranges. Whatever takes your fancy. I wanted an aromatic, comforting pudding-without-the-pudding dessert but I didn’t want it to taste like Christmas, so I opted for thyme and honey and lemons. If you can’t be bothered to make the labneh, serve with good quality yoghurt or crème fraiche. Preferably make the labneh the night before. You could make it in the morning and give it a few extra squeezes to help it along during the day if you are short on time. Mix salt into the yoghurt. Sit a strainer over a deep bowl and lay a large piece of doubled muslin (or tea towel) over the strainer. Pour yoghurt into the middle of the muslin and twist the ends up and tie together. I use a rubber band around the knot as well to make the cloth as tight as possible. Give the yoghurt a good squeeze getting out as much liquid as you can before leaving it to drain in the fridge overnight. In the morning, get your poaching liquid ready for the quince. In a large pot heat the wine, water, honey and sugar, stirring until the sugar and honey dissolve. 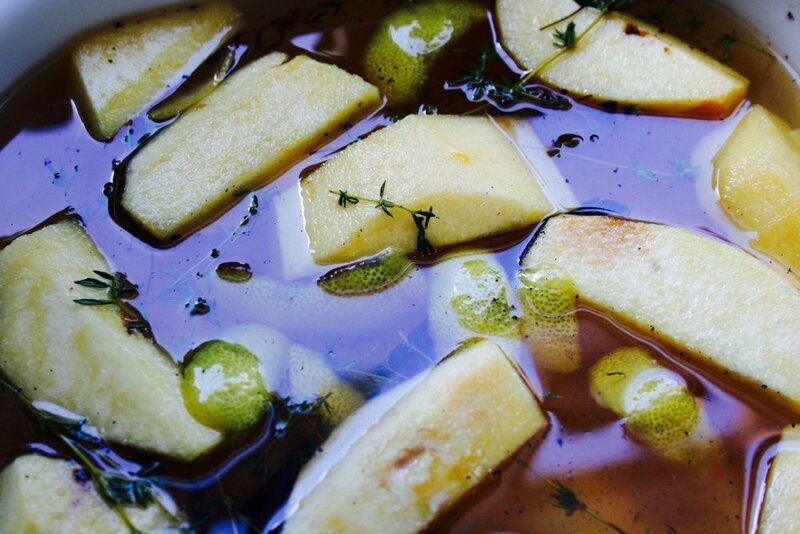 Add vanilla pod and seeds, peppercorns, thyme and the rind of the lemon and bring to the boil, then turn it down and let it simmer while you add the quince. Peel and core each quince, chop into quarters and add to the poaching liquid. (Keep the cores). Make sure you peel and chop one quince one at a time as they go brown quickly. When all of the quince pieces are in the liquid, turn the heat off and transfer to a medium sized baking dish. Cut a piece of baking paper the same size as the baking dish and place directly on top of the liquid, stopping the quince from rising to the top. Weigh the baking paper down with the quince cores you saved earlier. Cover with a lid or some foil and bake at 140 Celsius for 5-7 hours. 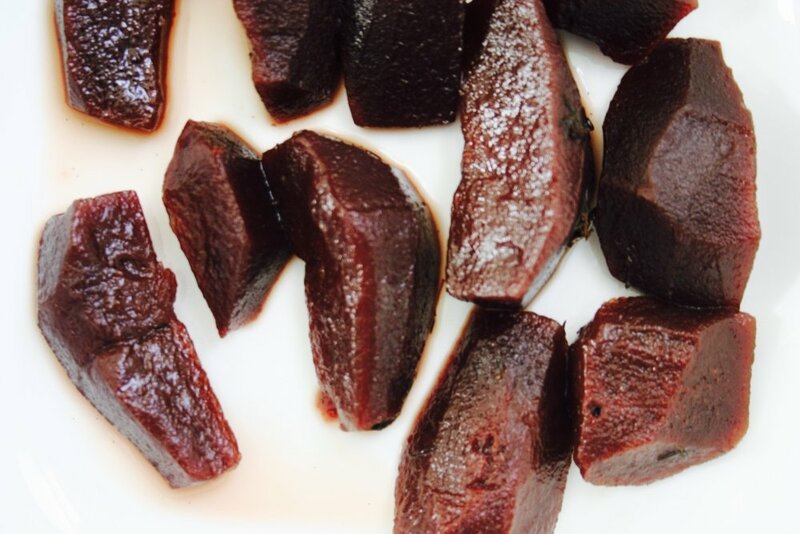 The longer you cook quince the darker and more beautifully pink-red-burgundy it becomes. When you’re happy with the colour and soft-ness of the quince take them out of the liquid and set aside. Strain the poaching liquid into a medium sized saucepan and bring it up to the boil. Simmer for 10 minutes until the liquid reduces into a thick syrup. Taste it at this point and add more honey or lemon juice to balance it out (I added the juice of half a lemon). To serve, take the labneh out of the muslin and give it a good stir. It should be a firm cream cheese consistency. Divide the quince between the serving bowls and dollop on some labneh. Pour the syrup over and sprinkle some pistachios on top. My sister and I ate the leftovers for breakfast, without the syrup and with some oats...it was equally lovely.